Mike and Cris were born and raised in the Chicagoland area where they currently reside with their Fury Babies. They are dedicated to working with and help every pet in their community live a happy, healthy life. After many frustrating years of working in grooming salons that focused on the quantity over quality, Cris was determined to find a way to open a salon that would focus on the health and safety of every pet while providing the best possible grooming experience available. Cris has continued her training and education and is now nationally ranked and has won numerous awards in the grooming industry. All groomers working for Spotted Paw are trained by Cris to ensure their commitment to Quality, pet safety and good habits. Mike used his business and marketing background, combined with Cris’s years of experience and training, pursued their dream. 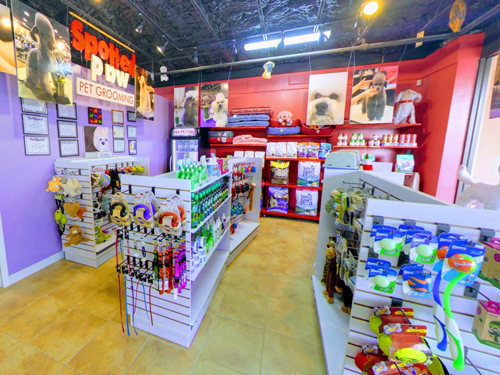 Spotted Paw Salon opened in Wheaton in 2011 and expanded to a retail shop - Spotted Paw Grooming & PET Goods. SPOTTED PAW: We treat your pets like family! By combining our dedication to Quality Services and Goods we can help keep your pet healthier inside and out to ensure longer lives. We are here to educate owners to change and improve your pet’s life. Our team is always available to consult with your pets dietary and grooming needs. From suggesting healthy food choices, to showing you proper bushing and hair care techniques. 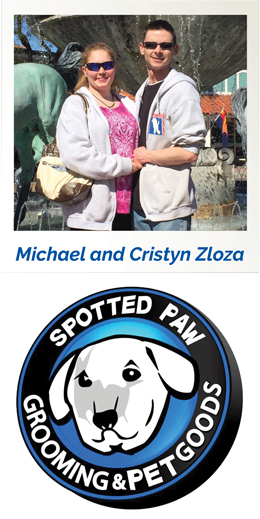 SPOTTED PAW: We strive to be an industry leader in offering the right healthy products to our customers. The same research and care goes into every toy and consumable product that we carry, goes into making sure our clients are educated correctly on the right products to use. Our FOOD promise to you and your beloved pet is our quality products offer NO corn, soy. NO by-products or chemical preservatives. Our foods and treats are never made in China. We are diligent in our research of selecting only the best goods that fit all lifestyles and budgets. SPOTTED PAW: We are getting ready to open 2 additional locations in the summer of 2018. The Warrenville Store will be opening the first week of June and then the Bloomingdale store will follow. We will continue to follow our grooming philosophy of quality grooming in a safe environment, over quantity. Expanding on this philosophy we have started to look toward helping keep our clients pets healthy and happy by offering them retail products that strive for this. SPOTTED PAW: With being a small business, we have had to use a multiple approach. Since we are creating our brand and had a limited number of clients to start with it was important that we used what strengths we had initially to help maximize our potential without raising unneeded cost. We used "Word of Mouth" marketing because there is nothing better than a client talking about us to other clients. From social media, to face to face, we made sure to provide avenues for where our clients could express their satisfaction and for it to reach new prospective clients. We felt for the cost and the true affect that when a client tells another client about us it is the best referral and marketing that you can have. 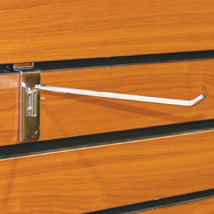 The next step in our approach was to work on in store marketing. We aimed at creating a high-end but warm feeling when you walk into our salon. This was key for us, because we are a family owned and wanted to present a friendly environment to all our clients human or dog. When you enter our salon, you get a professional environment that you can feel confident in to take proper care of your pet. Giving our clients a comfortable feeling each time, they will always want to come back to us repeatedly. SSS: 5. What is the most valuable lesson you’ve learned since launching your business? SPOTTED PAW: Stay focused on your core values while you continue to grow. Keep learning every day so you can continue to change and evolve to stay up to speed in the industry. SSS: 6. What solution/problem are you solving with SSS products and why? What are the results? 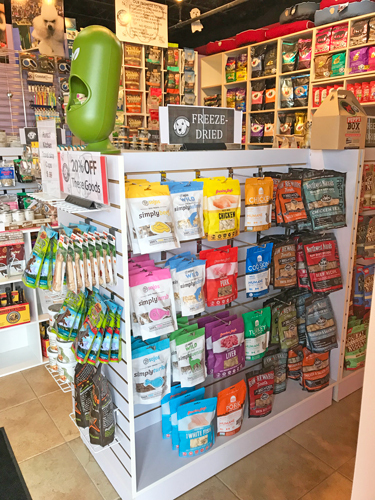 SPOTTED PAW: We love the organization and presentation that Specialty Store Services offer. 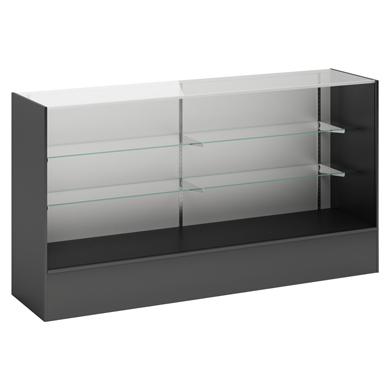 It allows us to display our products in a professional manner. Our results are showing in more sales. SSS: 7. 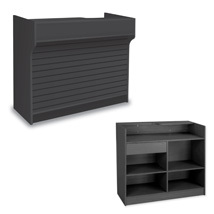 What are your favorite things you have ordered from SSS and how has it helped your business? 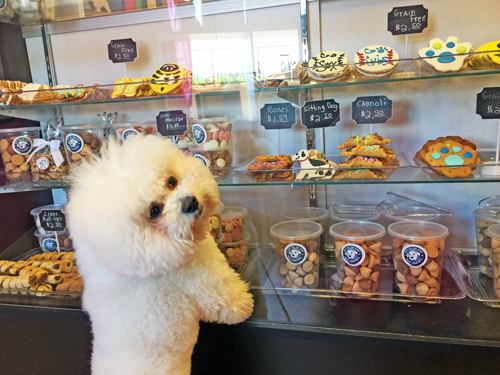 SPOTTED PAW: We LOVE our new bakery case. The presentation is so professional, and we are getting very positive feedback from our customers. 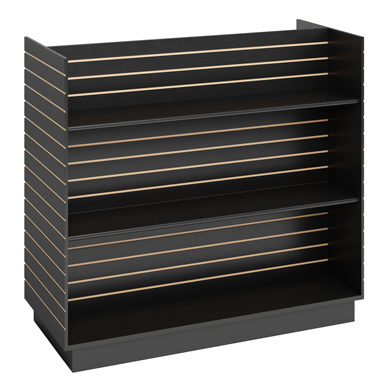 With the case’s open presentation, it helps draw eyes of clients pulling more attention, even when clients are just browsing. Come and check out our new bakery featuring all natural, locally baked cookies, cannoli, twists and treats for every occasion including sports teams and birthdays!